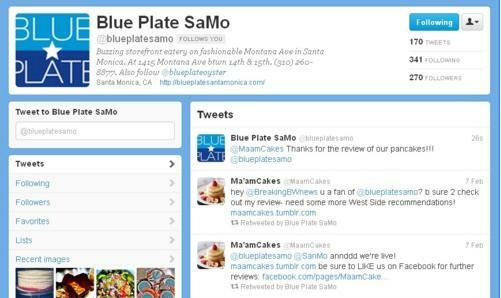 Blue Plate in Santa Monica Tweeted Ma’amCakes this AM about their Mac & Cheese Pancakes. CRAZY! What do You Think of this Original Concoction?? Through the recommendation of a friend, on Sunday I visited a restaurant I’ve never been to called Blue Plate, located on Montana Avenue and 14th Street in Santa Monica. I’m always slightly apprehensive to try a new restaurant, particularly because we all have our go-to spots- especially for pancakes! However, it is important for me, as a pancake-reviewer, to try new places in unfamiliar territory. Well, this little spot in the heart of Santa Monica is certainly a prize! Now, when a restaurant only offers basic pancakes (i.e. no specialty pancakes), it puts tremendous pressure on the quality of the pancakes available. After ordering the Strawberry Banana Pancakes, fortunately for Blue Plate, they succeeded in creating an incredibly tasty, yet basic, pancake breakfast. My biggest compliment about the Strawberry Banana Pancakes is that, to my surprise, the bananas were baked into the batter, and decorated atop with fresh & juicy strawberries. The glisten alone on the strawberries is a key visual indicator of the freshness of the fruit. After seeing this breakfast option on the menu, I figured both the bananas and strawberries would rest on top of the pancakes. Kudos to Blue Plate for creating such a small, yet important, switch in the norm of pancake breakfasts. While the pancakes themselves were fresh and tasty, the only comment I had about the pancakes was they were a bit dry. Typically, I barely put syrup on my pancakes; in fact, the true barometer of a tasty pancake is one that’s delicious enough by itself- without needing any syrup at all. Think of steak and steak sauce (see my Doughboy’s Review for reference). With my pancakes at Blue Plate, however, I found myself pouring way more syrup than usual. All in all, the compromise of the bananas in the batter and the strawberries on top is what made this basic pancake dish special. 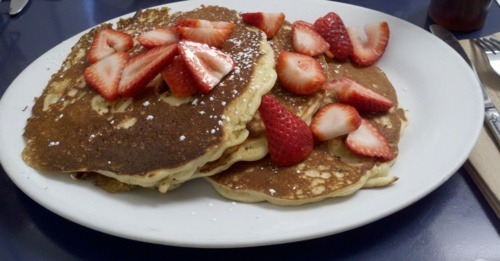 Thank you Jillian for this great pancake-breakfast recommendation in Santa Monica! Looks Like Santa Monica is Ready for My Review at Blue Plate!